I’m a city person. As far as I’m concerned, water comes out of a tap. 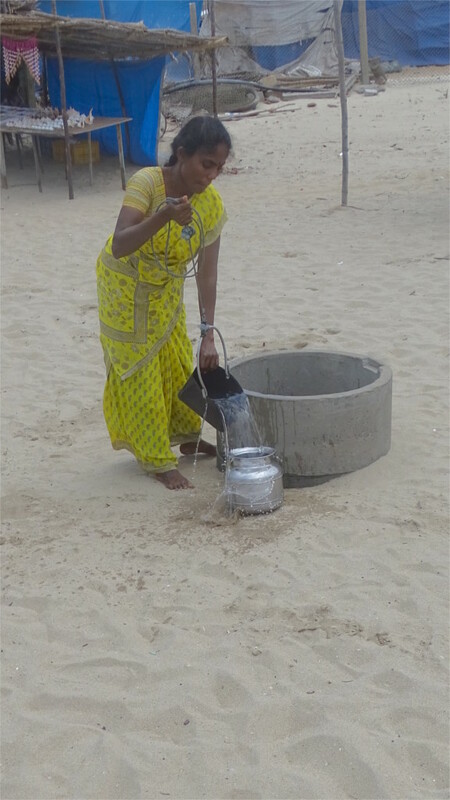 I’d not thought much about the water supply to the fishermen who live in Dhanushkodi until I noticed a woman drawing water from a well outside the church of coral. Suddenly the absurdity of my assumption struck me: the villagers could not possibly have had water piped in from the mainland. I walked up to the well and looked in. The water was fairly close to the surface. I wondered whether this was potable water, or strongly contaminated by the sea. At lunch we asked the fisher family which managed the shack we ate in. They said that they could drink the water. I was intrigued by the shallow aquifer near the sea. There must be studies of this, The Family said. A quick search led me to many studies of the quality of ground water in this region. It seems that seepage of sea water into these aquifers is a continuing problem. But the papers don’t answer the question which puzzles me: how large must the aquifers be on this island? It has seen large numbers of visitors over centuries, even before the population exploded in the last hundred years or so. For there to be any potable water at all, the aquifers must be either large, or quickly replenished. There is a lot about the geology of this area that is not well understood. The Ramarpalam which is visible above the ground, and the water table below are probably just two aspects of the interesting geology of this area. 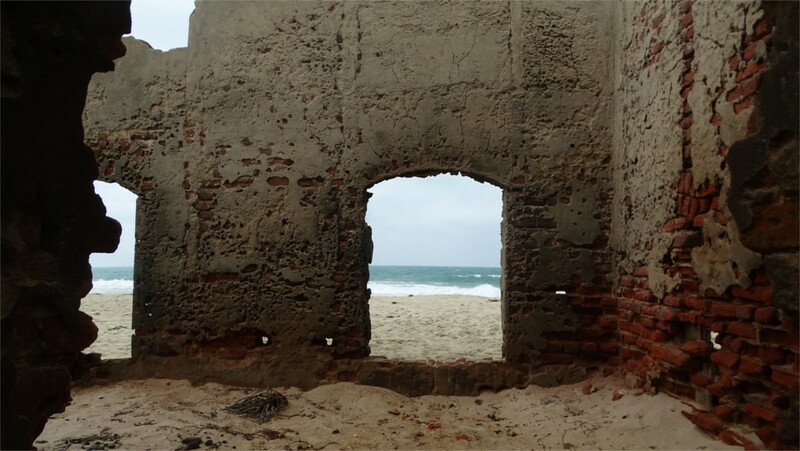 The drowned town of Dhanushkodi was big. You can still see the railway station, a post office, a big school, and a church. From the road I saw the front of the church with its niche for a bell. We’d just wandered through the ruins of some houses, but Sathiamoorthy was happy to stop the car. I walked up to the church wondering whether the bell tolled as the Christmas super-cyclone of 1964 approached. Maybe they had tied it down against high winds earlier. 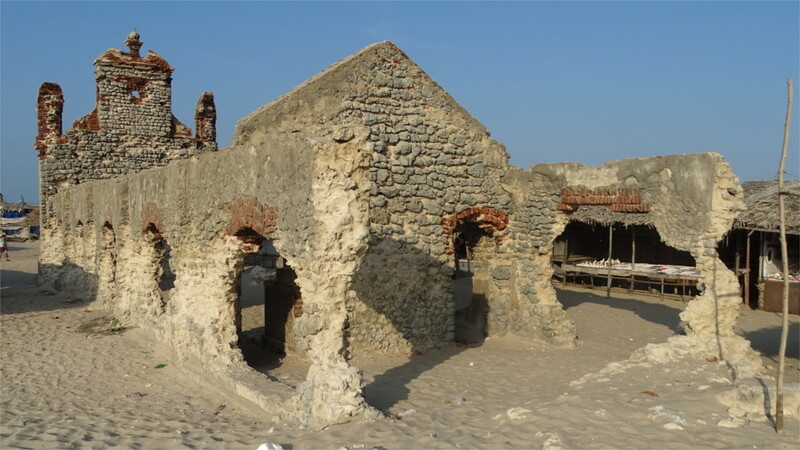 More than half a century, two generations later, there is no sense of tragedy here: only a romantic ruin standing on a clean beach. There’s a steady trickle of tourists. I waited for families to finish taking their group photos in front of the gaping doorway of the church. The last family was large, and apologized for the long time they were taking. I was happy to wait, I assured them. When they went in, the grandfather said to me, “I can’t walk any more.” I told him he was not in the way. I liked him sitting there to give a scale to the photo. So many tourists stop here that a large cluster of shops in shacks has sprung up around it. I walked around the structure and looked in through a hole in the wall to find that the altar is fairly undamaged. It would have been raised fairly far above the pews, but it is now level with the sand. I realized that the hole that I was looking through would have been a window, possibly raised waist high above the floor of the church. That is a lot of sand, but then it has been many years since the church was abandoned. There was something interesting about the wall. I stepped forward for a closer look. The church walls had been built of blocks of coral, brick was only used in arches. What an amazing thing to do. The church must have been for the use of the British functionaries here. Stones had been transported to make the railway station and the port. 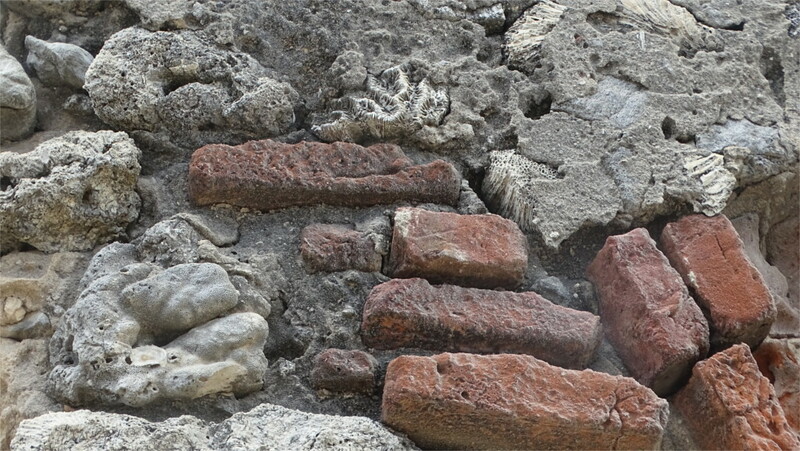 Bricks had been used in houses. It must have been a conscious decision to make this church out of coral. You can see three different types of coral in the photo above. The storm of 1964 killed the reefs here. I wondered whether the previous half a century of work in the surrounding waters had depleted the reefs so much already that the storm just struck a last blow. We came back later before sunset to walk on the beach here. The sand is very clean. There aren’t even the remains of sea shells. From the number of shops here which sell things made of sea shell, I guess there must be beachcombers busy at work after every high tide, picking up whatever has been washed ashore. I walked out towards the incoming tide to take this photo. The salt wind and water must be at work to wear down this remnant of a short lived port. The atmosphere is gently corrosive. No lichens or moss grow on the walls of this church. We were on the verge of a bad sunburn as we walked away. Pamban island is supposed to be a good place to watch migratory birds starting in October. We were probably a couple of weeks early, but The Family had packed her binoculars. As it turned out, the beaches were so wonderful that we forgot to take time off to go look for birds (yes, you’re right; we are not natural born birders). On the occasional mud flat next to the sea in Dhanushkodi we saw very few birds: some sandpipers, no egrets, kingfishers, herons or gulls. If the migrants had already started coming then we should have seen some. We saw lots of crows and black kites (Milvus migrans) beating against the wind. Looking closely at them I realized that there were several Brahminy kites (Haliastur indus) amongst them. These are close relatives of the more common black kites. 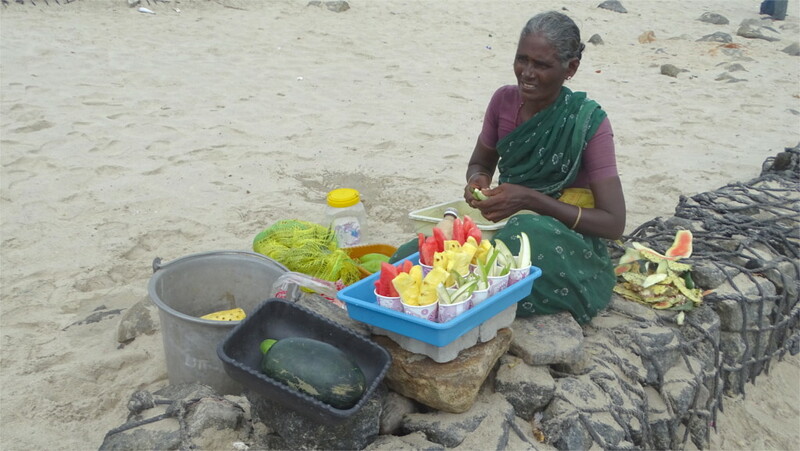 I eventually took a photo of one at a tiny pond next to the road in Pamban town. These strikingly coloured scavengers are found in an arc of land from India through south eastern Asia all the way to Australia. It has been a long time since I saw them. Interestingly, although their numbers are decreasing rapidly, they have still not fallen catastrophically enough to move them out of the “Least Concern” category of the IUCN red list. I don’t really need an excuse to post photos of boats do I? If you want me to give one, I’ll give you three. 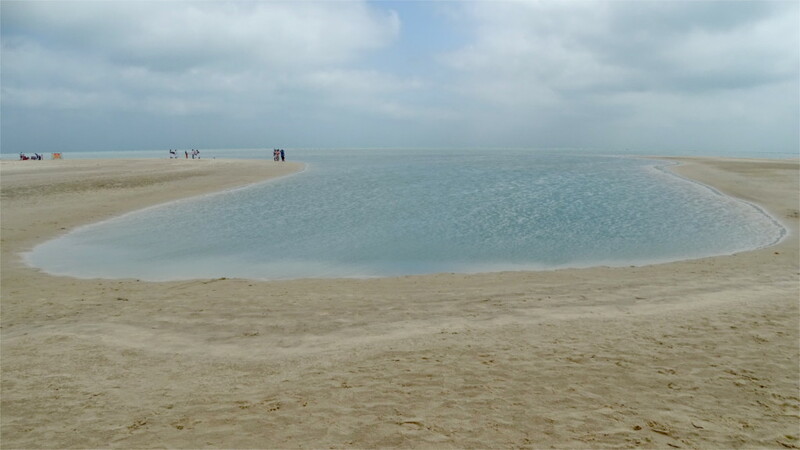 The featured photo has great sunlight from Dhanushkodi and a calm blue sea. That’s good enough. This boat will never put out to sea again. Let it lie. And this? They want to go fish. Many of the beautiful ancient temples of India have taken to forbidding photography inside. This recent development means that the historic sculptures and beautiful architecture cannot be captured on film any longer. The Kothandaramaswamy temple in Dhanushkodi is more nuanced. It forbids photography of the main idol of Rama with his bow (kothanda), but otherwise photography is allowed. I wasn’t prepared for this, so I couldn’t take photos of the idol of Vibhishana. This idol was special, because the temple is said to commemorate Vibhishana leaving his brother Ravana to join Rama’s army. One can see from the idols inside that the temple is post-medieval. The intricate sculptures that one sees in the Ramanathaswamy temple and its contemporaries are also missing. 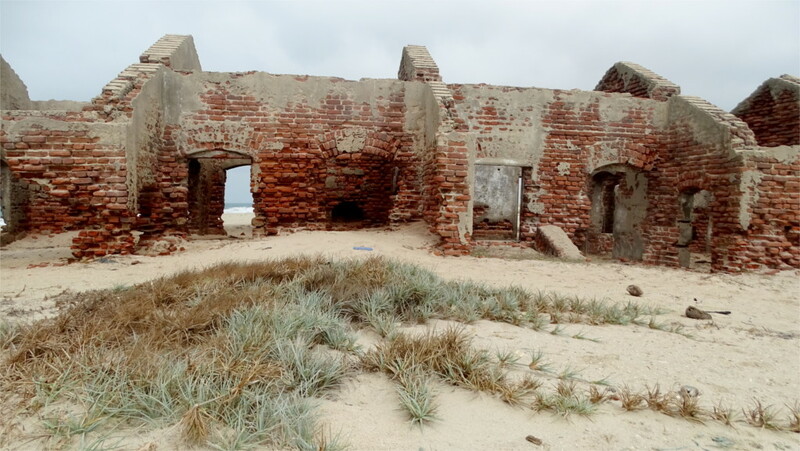 It is a few kilometers away from the drowned town of Dhanushkodi, and was spared destruction in the hurricane of 1964. 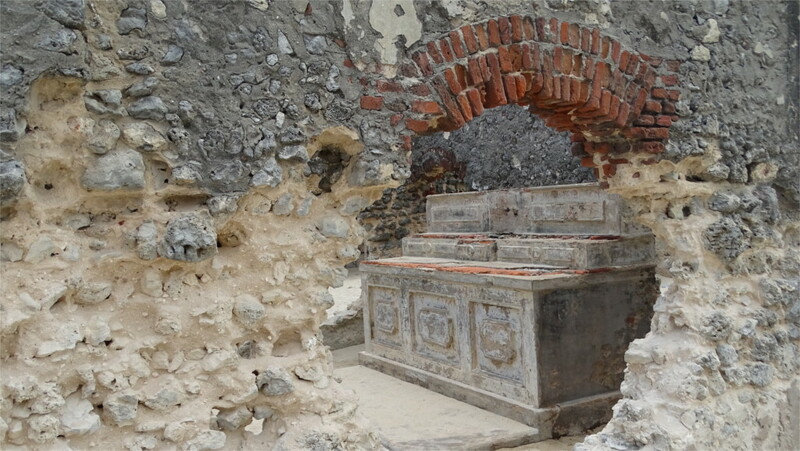 However, it must have needed repairs, because a large stone tablet at the entrance says that it was restored between 1976 and 1978 by Mugneeram Ramkumar Bangur of Calcutta. The structure, with its flat roof, is clearly 20th century modern. 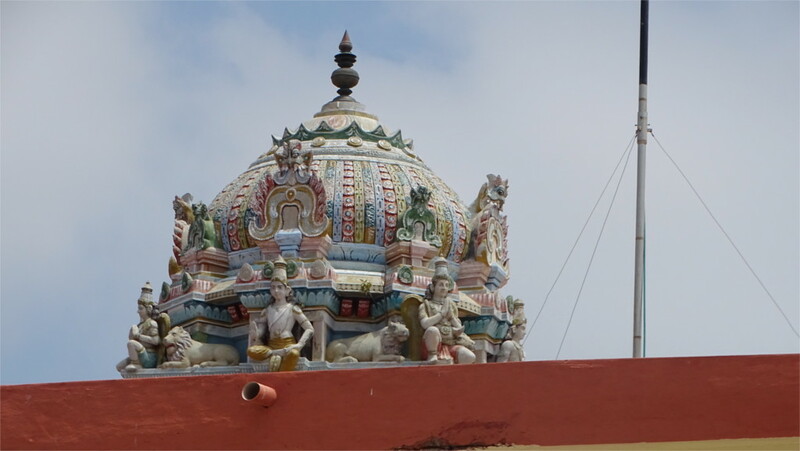 A nod to traditional temple architecture is the well-decorated dome at the center of the roof. I’m very fond of the modern clay images which decorate temples in south India. This one had particularly interesting examples. I specially liked the figure you see in the featured photo, one of four facing the cardinal directions. It incorporates many different artistic influences. Like many minor but important temples, this was surrounded by trees. 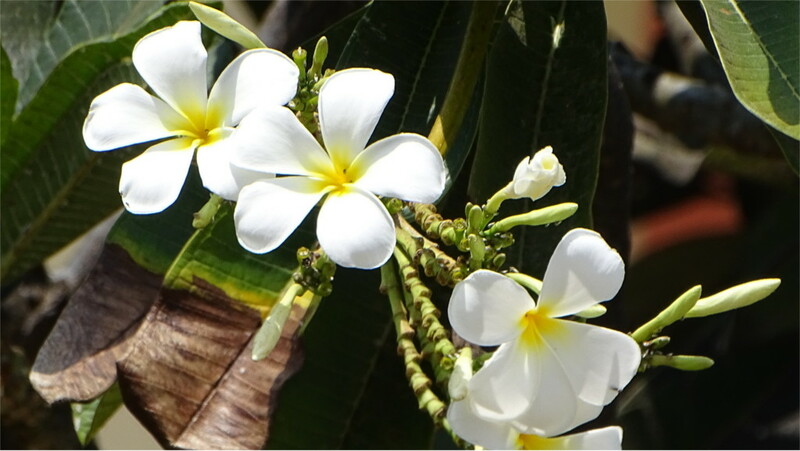 The champa was in bloom, and its fragrance overlay the briny smell of the sea. It added a nice note to this calm temple. 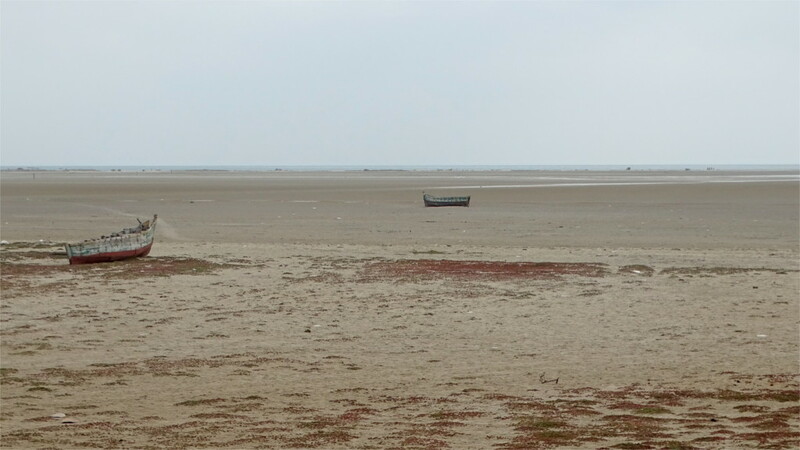 The high and low tides were at convenient times when we were at Dhanushkodi. The morning’s low tide was at 10:30. This would give us two to three hours at the beach before lunch. We could have a short break after that, before going down to the sea side again for the incoming tide. Sunset was about an hour after high tide. The sun, the moon, and the earth were cooperating with us for a wonderful holiday as we drove down a long narrow spit of land which pointed at the only land border between India and Sri Lanka. That border is a great story, whose beginnings we would see during the day. Driving to Dhanushkodi at low tide, we saw breakers on the sea to our right. We parked and walked to the beach past a signboard warning us not to go into the sea. I love to tread a path at the very edge of the surf before getting my feet wet; the popping of the millions of tiny bubbles sprays your feet with cool water. 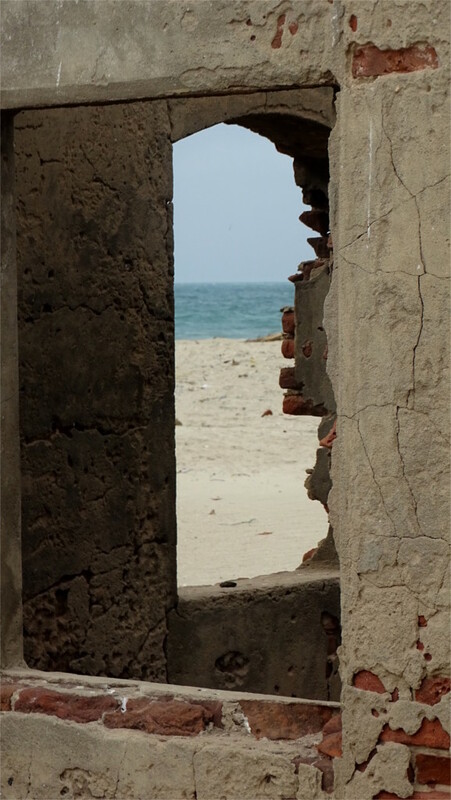 This side of Dhanushkodi faces the Gulf of Mannar. The hard packed sand sloped into the waves. The sky was a little overcast, but the contrast of the warmth in the air and the cool water was wonderful. We obeyed the signboards and stayed out of the sea; standing on the beach for breakers to land on our legs. When we got back in the car, Sathiamoorthy had decided to protect it by laying newspapers on the floor. On the left the level sands stretched far away to the horizon. The waters of the Palk strait was a faint blue line very far away. Clearly this side sloped very little. Sathiamoorthy said something about “soft sand”. Later I realized that this meant quicksand. I would have a much closer look at quicksand later. All I could see from the car was that some parts of the sand looked much more wet than others. 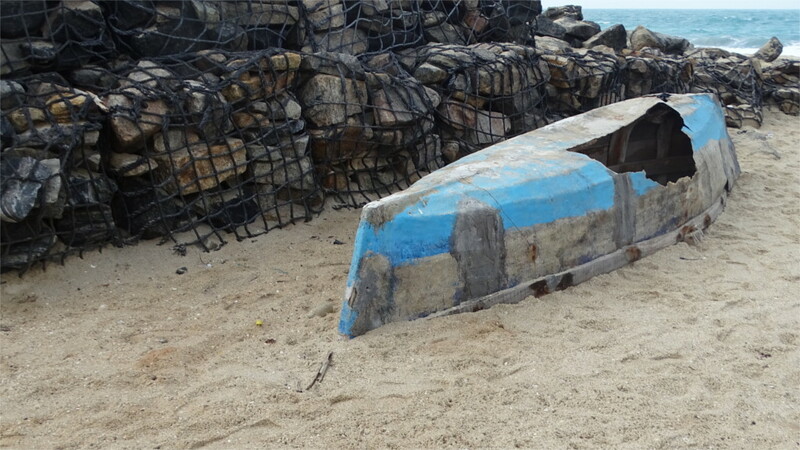 I loved the look of the boats beached so far from the sea. The road now ends at Arichamunai, the very tip of this spit. We walked down to the beach. Along the way we had stopped at empty beaches, but this part was full of people. 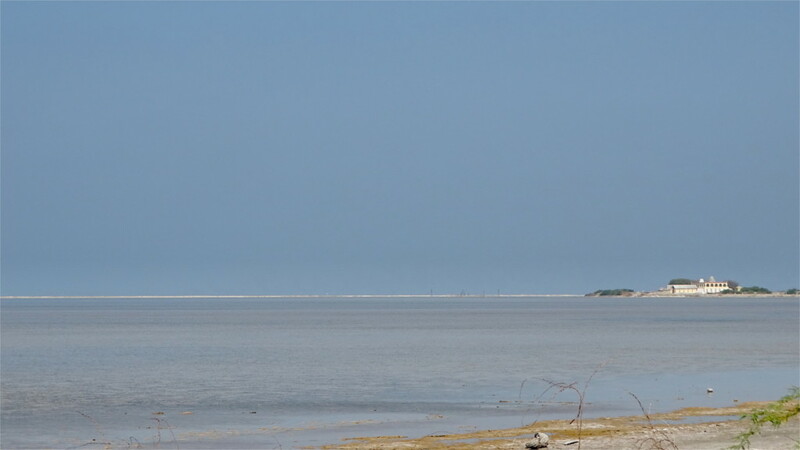 We walked along the edge of the water, noting the stillness of the water in the Palk strait and the strong contrast with the breakers on the Gulf of Mannar. As we walked, we noticed how the waters are eroding the beach on one side and depositing sand on the other. This turns out to have been studied extensively. The tip of Arichamunai is not a fixed point on the map. It waves back and forth by more than a kilometer when observed for a decade. Sandbars detach themselves, and join the land somewhere else. This is land as fluid as the sea. When we stepped on to a very wet patch of sand, people around us shouted for us to get back. That’s when I realized that this “soft sand” is quicksand. A policeman had begun to shoo tourists away from this area. It was time for lunch, in any case. We climbed up to the traffic circle. Beyond this beach the extended pattern reefs called Adam’s Bridge or Ramarpalam form a link between India and Sri Lanka. Sandbars accrete around them, some more stable than others. One of the longer lived sandbars, about 15 Kilometers from here nowadays contains the only land border between India and Sri Lanka. If you walked across Ramarpalam from the east, then Arichamunai is where you first know you are in India, from the low-cost version of Ashoka’s pillar planted right at the center of the circle. 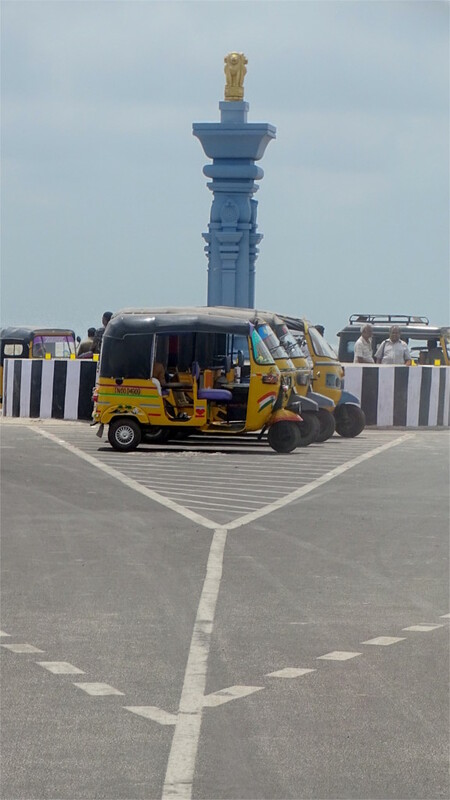 Some help in recognizing the country is also provided by the rickshaws lined up to take you to Rameswaram, or the many people selling freshly sliced watermelon and pineapple around the circle. When we came back at high tide the wind had picked up. At Arichamunai the wind was driving the sand very hard. 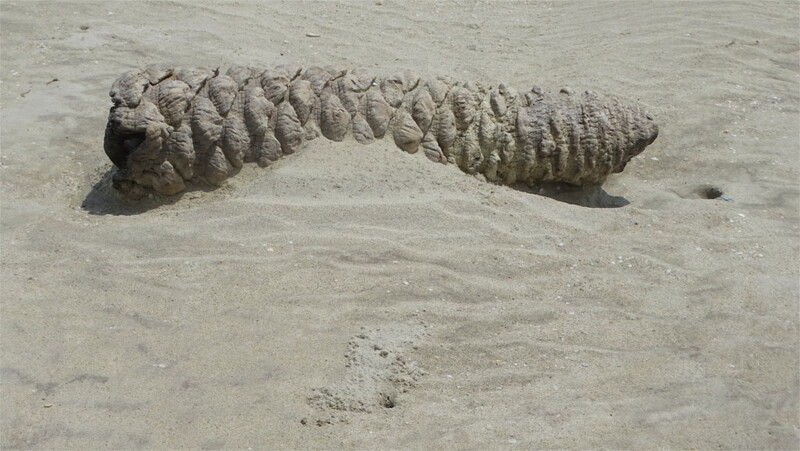 On my legs below my knees I could feel the constant prickling of blown sand. What little I remembered of Bagnold’s classic book verified the evidence of my eyes: the sand grains here are big. The beach is not old enough to have created dust. My slices of pineapple spiced with red chili powder were safe from dust and sand. The sea had come in very close on the Palk strait side. 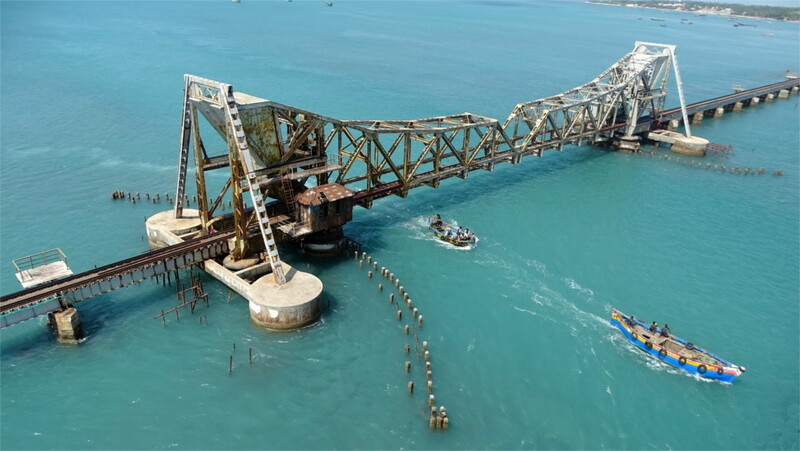 If it hadn’t been for a causeway the Kothandaramar temple (photo above) would have been cut off from Dhanushkodi. I took this photo just before high tide. Right at the horizon you can see a white salt-encrusted sand bar. The day’s tide was too low to drown it. I had read up on the Christmas cyclone of 1964 before travelling to Dhanushkodi, but nothing had prepared me for the sight of the town which was destroyed by what we would now call a super cyclone. This was one of the first such storms to be imaged by satellite, and the largest storm which has ever straddled the equator. On the bright and sunny day when The Family and I walked through the destroyed town it was hard to imagine the storm. A low pressure zone was spotted in the Andaman Sea on December 15. This grew as it traveled west-northwest towards Sri Lanka. Satellite imagery was at its infancy at that time, but the storm was unusual enough to attract attention. It developed peak steady winds of 240 Km/hour, with gusts estimated at 280 Km/hour, just before it hit Sri Lanka on December 23. The storm surge peaked in Dhanushkodi and reached 7.6 meters, completely drowning the town. A train was submerged killing 200 passengers. 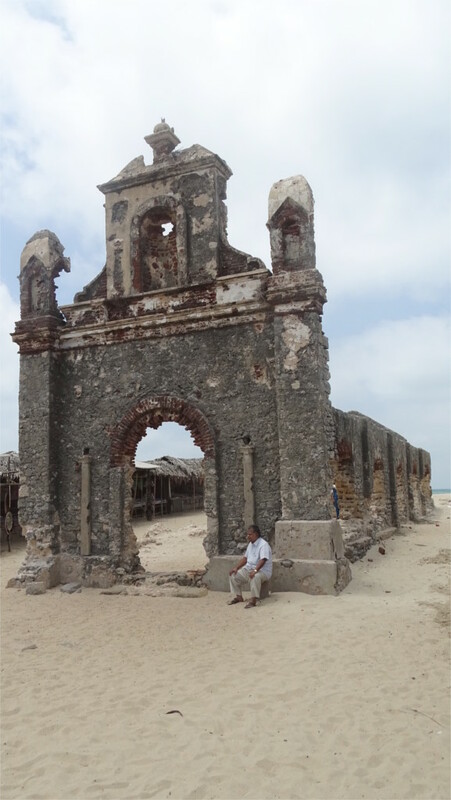 The port of Dhanushkodi was an important link with Sri Lanka since 1914, with a busy custom house. 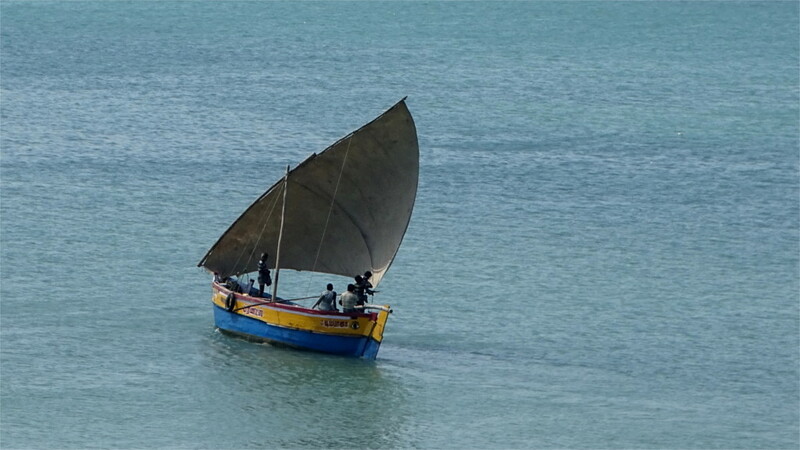 Over 800 people drowned in the town, and many fishing boats were lost. A single road now passes through a narrow spit of land. We saw a row of broken houses near the old railway station and decided to walk up to them. They looked like colonial bungalows, the kind that would house the families of high-ranking railway staff. The Family and I walked separately around the lonely building. The sea was slowly reclaiming it. Buildings of this kind had tiled roofs. 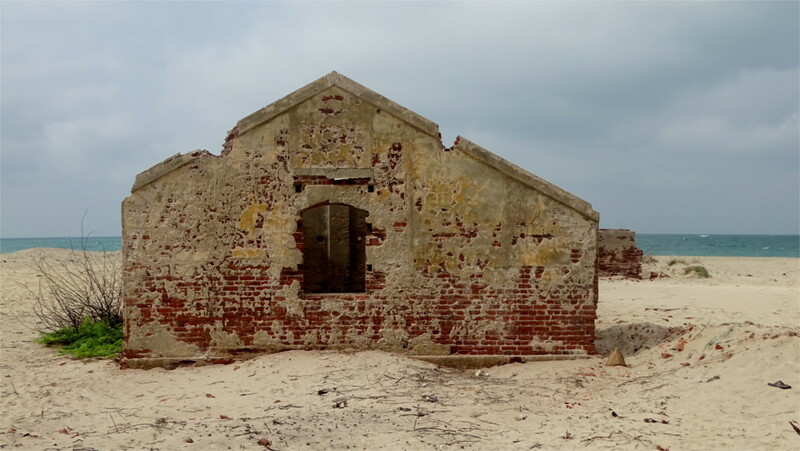 They must have blown off right at the beginning, and the storm surge would have engulfed the whole structure. If there were people inside, they had no chance of survival. There is nothing here any more. Empty doorways gape at the sand and sea. I had expected to find moss and growth. There’s very little of that. The tides wash up high fairly often these days. The coral reefs were destroyed in the storm, and the sea and sand have been shifting ever since. The plaster over the bricks is slowly falling away. The exposed bricks were wet and bright red. The tide was now at its lowest, but the bricks had not dried since the last high tide. My needs are simple: a nice beach, good sun*, clean sand**, food and drink. Other simple needs include: being far from home***, a clean and comfortable bed to sleep in, enough plug points to charge my phone, laptop, and camera, a good breakfast, reasonable wifi****, fresh fish, good coffee, a nice aromatic tea*****, lots of water to drink. Simple really. That’s all. I do appreciate a lack of mosquitoes and other biting insects, a shower whenever I feel hot, nice people******. Not too much to ask for, is it? But I would give that all up for an interesting photo. This shack on Dhanushkodi beach had nice coffee and great chiaroscuro. Later, walking along the beach I stopped at the play of light and shadow on a piece of driftwood. 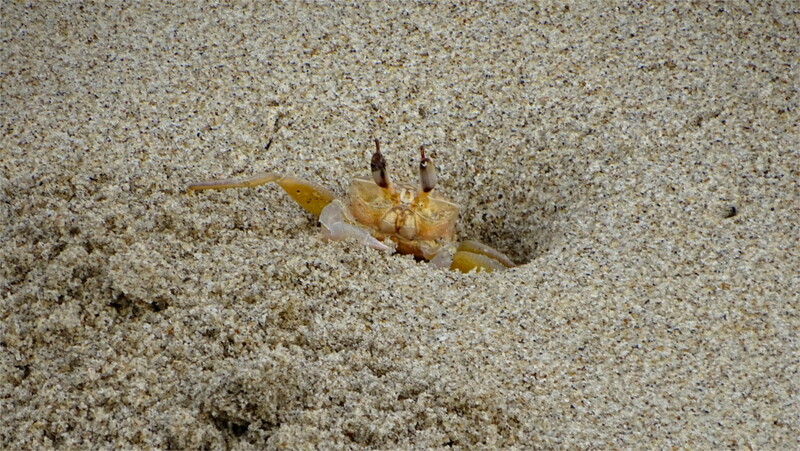 No crab poked a head out of their bolt holes. (***) But with a comfortable connection without too many layovers. (****) That can’t be hard, can it? (*****) Make that hot, please. I hate cold tea.